That’s why you protect theirs. 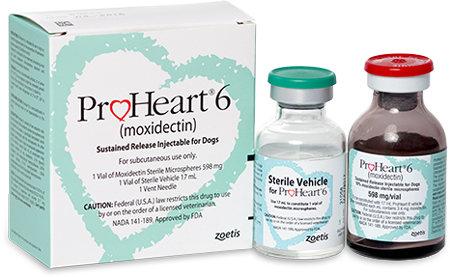 Only ProHeart® 6 (moxidectin) provides 6 months of heartworm disease prevention in 1 injection. Hear why these veterinarians choose ProHeart 6. ProHeart 6 is a twice-yearly injectable heartworm disease preventative. It’s the only heartworm product that provides six months of continuous protection against heartworm disease with a single veterinary-administered dose. Client can’t forget to administer monthly doses. The only sustained-release heartworm disease preventative that eliminates concerns about compliance for six months at a time. Twice-yearly injections vs. 12 monthly doses given at home. A 56-day shelf life helps ensure you have plenty of time to use each reconstituted vial. Twice-yearly visits help you monitor the patient’s health. Parasiticide purchases remain within your practice’s pharmacy. IMPORTANT SAFETY INFORMATION: PROHEART 6 should be used in healthy dogs. Do not administer to sick, debilitated, underweight dogs or dogs that have a history of weight loss. Prior to administration, PROHEART 6 certified veterinarians should continue to assess patient health through a medical history, physical examination and if deemed appropriate, diagnostic testing. Continue to use caution when administering PROHEART 6 concurrently with vaccinations. Adverse events, including anaphylaxis, have been reported following the concomitant use of PROHEART 6 and vaccines. In some cases, anaphylactic reactions have resulted in death. Use with caution in dogs with pre-existing or uncontrolled allergic disease (food allergy, atopy or flea allergy dermatitis). Dogs receiving PROHEART 6 should be tested for existing heartworms as per the product label. In people, avoid PROHEART 6 contact with eyes. If contact with the eyes occurs, rinse thoroughly with water for 15 minutes and seek medical attention immediately. PROHEART 6 is available only to veterinarians through a restricted distribution program. Only certified veterinarians and staff can administer it. To obtain additional information including a copy of the product labeling, click here or call 1-888-ZOETIS1 (963-8471). Lue TW, Pantenburg DP, Crawford PM. Impact of the owner-pet and client-veterinarian bond on the care that pets receive. J Am Vet Med Assoc. 2008;232(4):531–540. The in-use shelf life of ProHeart® 6 (moxidectin) is now 56 days. This update gives you twice the time to use each reconstituted vial of ProHeart 6 and help prevent heartworm disease in your practice’s canine patients. The in-use shelf life of reconstituted vials of ProHeart 6 is now 56 days. The update only applies to ProHeart 6 purchased on or after 9/26/2016, as the product packaging has been updated. ProHeart 6 formulation is unchanged. FDA-CVM approved this label change as effective  and appropriate after reviewing the necessary Zoetis in-use stability studies.